This is the fifth and final installment of a series about tracking your fitness progress. The first four were devoted to the use of body fat percentage as the primary metric while this one focuses on other methods you can use. Part 2: Using a body fat scale. Part 4: How to track your progress using body fat %. Other than body fat %, there are dozens of other ways that you will see progress. From appearance, to ability, to clothing, the benefits of being fit will seem endless. Progress will often be slow, but it will come if you are doing things right. There isn't anything here that will be as comprehensive a measure like body fat is, but taken as a whole they can help confirm that what you are doing is working. This might just be the most obvious one. We're talking about just simple appearance. You should start your efforts with a picture that you can use as a "before" picture. This picture doesn't have to be the standard "before picture" that a lot of people use. No standing in your underwear in front of a mirror if you don't want to! Just use a picture that shows you as the rest of the world sees you. Maybe you have a recent family photo or something from a recent gathering. Can you see your collar bones? How about your hip bones? Just how does your body fit just above your jeans? How does the skin around your neck look as you move? Can you see the vertical line on each side of your stomach? That line is the edge of your external oblique. Can you see the horizontal and vertical lines that make up your six-pack? Those lines are the ones that form around your rectus abdominus. Yes, I know that your family photos may not show whether or not your six-pack is visible, but you can keep an eye on that on your own. I'm often asked if I do fitness evaluations as part of my training regimen for clients. My answer is always an emphatic yes. But, the thing is, you may not even realize it. That's because, every exercise - that's every set from every workout - can be an evaluation. 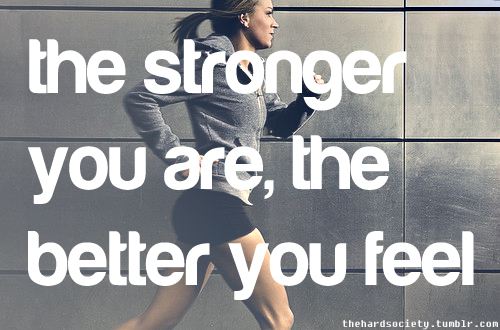 And, every time you evaluate yourself this way, it is while you are exercising. So... Every evaluation is an exercise and every exercise is an evaluation. Keep an eye on how much additional weight you are lifting over time, how much faster you go through your workouts, how much you get done in your workouts, and how long you can go. No one thing is all that comprehensive, but added to everything else you can track, it adds to the overall picture of progress that you can pain for yourself. Think about all of the times throughout your day that you use your body to do things. That sounds a little silly, right? You use your body to do everything, right? Well, of course we do -- that's why it is so important to take care of our bodies. But, there are specific tasks that you have on a regular basis that test what your body can do and times when your physical abilities limit what you can do. Maybe it is walking up the steps to your apartment or quickly walking from the parking lot into the office or lifting your suitcase into the overhead compartment on an airplane. Maybe you walk with a friend who keeps a naturally fast pace (yeah, I'm normally that friend) and you have to work to keep up. This can sound like the kind of result that comes secondary to everything else in fitness, but that's not how I see it. Results like these certainly are anecdotal and not a comprehensive measure of your fitness, there's no doubt about that. But, these results are the reasons that we should exercise! We should be spend time in the gym training to better handle the sport of life outside the gym. You should look at this just like you look at things you can do outside the gym. It is difficult if not impossible to really quantify how you feel physically, but it is one of the main reasons you should exercise. Do you attack your day with the energy that you need to get through? Even with that energy, can you maintain a level head and deal with tougher problems with relative ease? Are you confident in yourself as you navigate your routine? These are all areas where fitness can make a difference. This is probably one of the first differences you will notice as you start exercising. Jeans fit a little looser and shirts fit a little different. If you are a woman and on the thin side when you start, don't be surprised if shirts feel a little tighter in the shoulders over time. That's because a lot of manufacturers make shirts for women who have very small shoulders -- and I mean really small shoulders. Women who are healthy and strong have some shape to their shoulders and, in time, you will too. This is really tough to measure, but will help to reinforce other quantifiable measurements. 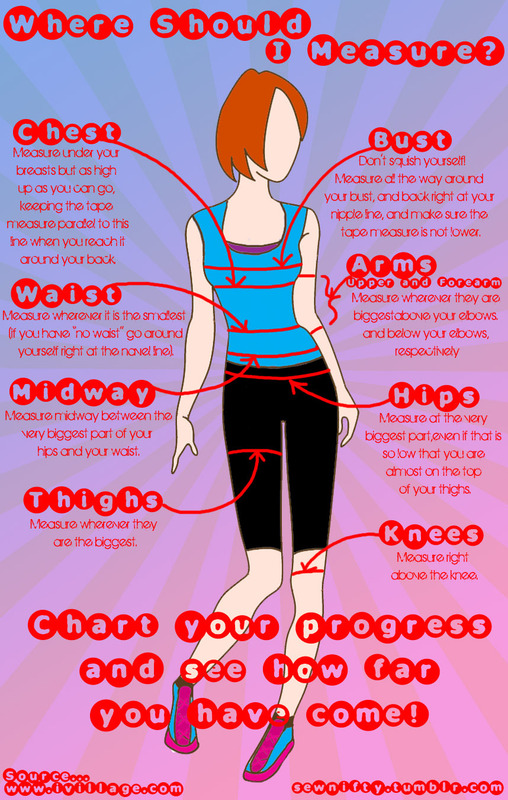 This graphic shows a number of different places on the body that can be measured and tracked over time. Some of these measurements will require help from a trusted friend while you can do others on your own. Waist: Belly fat, the fat stored around the waist, has been linked to a number of health problems particularly cardiovascular disease. Read more. For most of us, this is the first place in the body where fat is stored and the last place where it is used. Don't be surprised if it takes some time before you really see significant progress here. Give it time, though. Once you have used up stored fats elsewhere, your body will have no choice but to use the fats covering your stomach. Hips: Many women's bodies store a lot of their fat in their hips, buttocks, and thighs. If you are really aware of your hips, it can help to measure them on a regular basis to see how much progress you are making. Just like those of us who store fat around our waist, don't be surprised if it takes a little time before you see a change here. The real change here may not come until you've worked through stored fats elsewhere in the body. Anything else that really bothers you. Be advised that measuring at other parts of the body won't show you the kinds of change as measurements at the hips or waist. There just isn't enough of you to measure. But, if there is something that really bothers you, it can help to track how that area is doing over time. You typically won't see results as quickly with physical measurements as you will if you track body fat %, so I advise taking them once per month. There is a downside to this, though. Just like other measurements, there is going to be some variation from one day to the next and throughout the day. To handle this, I suggest taking a set of measurements two or three times over the course of a few days. In doing this, you aren't trying to see a change over juts a few days. Instead, you are trying to gauge how consistent your measurements are. Remember, the body stores fat based on a myriad of factors -- some of which aren't even completely understood. You can't "target" the fat in specific areas of the body with exercise. All you can do is influence the total amount of fat that your body stores. This is the myth of spot reduction. And I've talk about this some in the past. I'll just remind you that muscle is built specifically while fat is burned generally. So, your main form of fitness tracking should be done through body fat percentage. I spent the previous four posts explaining why that is and how to use this measurement. Beyond that, the ideas I've given you in this fifth installment will help to support what you are seeing with that primary measurement. If you are doing this right, by eating well, staying active, and doing some strength training, you'll see slow steady results across the board.